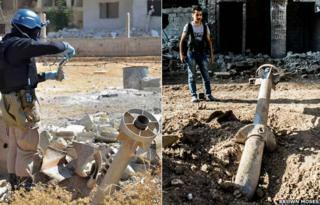 Syria has been given until the middle of 2014 to destroy its chemical weapons stockpile. But in a country torn apart by civil war, the disposal process is likely to be fraught with difficulties. So how will it work? Neutralisation of the chemicals by the addition of water and a product like caustic soda. Destroying chemical weapons, armed with explosives, carries extra risks. One solution is the use of mobile destruction units, which can be moved into place relatively quickly and therefore avoid the dangers of transporting live weapons through a warzone. Some of these mobile units destroy chemical agents by surrounding them with explosives and placing them in an armour-plated chamber, known as a "bang box". The explosion destroys the munition and the chemical agent. The US military has developed a mobile unit, called the Explosive Destruction System (EDS), which uses chemicals to neutralise the toxic agent. It has been used to destroy more than 1,700 items in the US since 2001 and can handle up to six weapons at a time. Image caption Rocket with chemical warhead is loaded into a steel cradle with an explosive charge attached. Image caption Cradle containing rocket loaded into steel drum and explosive is detonated to release toxic contents. Chemicals are added and the drum is rotated to mix and neutralise contents. Another system which may be employed in Syria uses so-called "hot-detonation technology". It heats the munitions inside a detonation chamber to about 550 degrees C - hot enough to destroy the weapon and its chemical contents. This method has been developed by a Swedish company Dynasafe and is being used in the destruction of chemical weapons in China, Germany and the US. It remains unclear which techniques will be used to destroy the Syrian chemical weapons. The Organisation for the Prohibition of Chemical Weapons (OPCW) - which is supervising the task - has said all "expedient methods" would be used. Chemical agents that have not been loaded into weapons are simpler to deal with. The intense heat of the furnace transforms the agent into less harmful products that can be dealt with as hazardous waste at a commercial treatment centre. But environmental concerns about incineration have meant that the neutralisation has grown in popularity as a process. The chemical agent is pumped into a tank, where water and caustic soda are added, which makes it less toxic and treatable either as hazardous waste or it can be incinerated in a second tank. The chemical weapons can be destroyed in situ using mobile units, or moved to another location for large-scale processing. Ralph Trapp, formerly with the OPCW, said: "One thing I can say for sure is they are not going to do it the normal way, where you have the time and leisure to consolidate the stockpile. That is going to take a few years. They don't have the time to do that." He suggests the Syrians may have to adopt a more "patchwork approach" where weapons are first put beyond use, by removing the charges and filling the payloads with concrete, or burying them in concrete. Under the terms of the Chemical Weapons Convention (CWC), dumping chemical agents at sea or burying them deep underground is not allowed. Destroying weapons by carrying out controlled explosions in deep pits - an approach used in Iraq in the 1990s - would also be excluded by the convention, because of the risks to the surrounding population. Patricia Lewis, from the London-Based think tank Chatham House, says she would favour shipping the bulk agent out of Syria to a country like Russia. "Because Russia has taken the initiative here, they have that responsibility now to make sure it works." Russia has a naval base at Tartus in Syria where the chemical weapons could be taken and then shipped to another location. But there may be concerns, under the CWC, about allowing the shipment of chemical munitions through foreign waters. Russia already has a chemical weapons destruction programme, although it is currently operating at full capacity and still has a considerable amount of Russian weapons to destroy before its programme is complete. Where have weapons been destroyed before? Iraq and more recently Libya have both had chemical weapons stockpiles destroyed. In Iraq, UN weapons inspectors located chemical weapons facilities and sealed them up. Once sealed they were effectively put beyond use. Alastair Hay, professor of environmental toxicology at Leeds University, said the Iraq model was a possible option. "As long as these things are secure, that is the first guarantee and then you have to set about destroying them in the best way possible," he said. The Libyan stockpile was much smaller and a disposal plant was built to deal with it - although a further stockpile of mustard gas was later uncovered after the overthrow of the Gaddafi regime. Under the terms of the CWC, Syria has been given nine months to complete the destruction of its chemical weapons. Syrian President Bashar al-Assad has said he is committed to a plan to destroy his country's chemical weapons but warned it could take about a year. Professor Hay said he hoped the Syrians should be given a bit of "latitude" - if the destruction programme falls behind: "If the work is going well, and for some technical reason there is a hiccup, or if the sheer volume of material cannot be processed in time, I am reasonably hopeful that if it is clear that Syria is not just stalling for time, then there will have to be some give in the deadline." US and Russia have the biggest stockpiles of chemical weapons-related equipment in the world. According to the OPCW about 81% of the world's declared stockpile had been destroyed by July 2013. The US had destroyed about 90% and Russia about 74%. However deadlines had already been extended from 2007 to 2012 and now Russia has pledged to complete its programme by 2015 and the US 2023. Both Russian and the US are signatories to the CWC and enforcement of the convention is overseen by the OPCW, based in The Hague. The OPCW provided the scientists who carried out the recent weapons inspections in Damascus and it is likely it would oversee the destruction programme. The chief UN weapons inspector, Ake Sellstrom, told the BBC it would be difficult to find and destroy all of Syria's chemical weapons, but he believes it is achievable: "It is doable, but of course it will be stressful work. "Depending on the position by the Syrian government and the position by the opposition. Depending on how much they could negotiate. It could be done. It would be a difficult job."